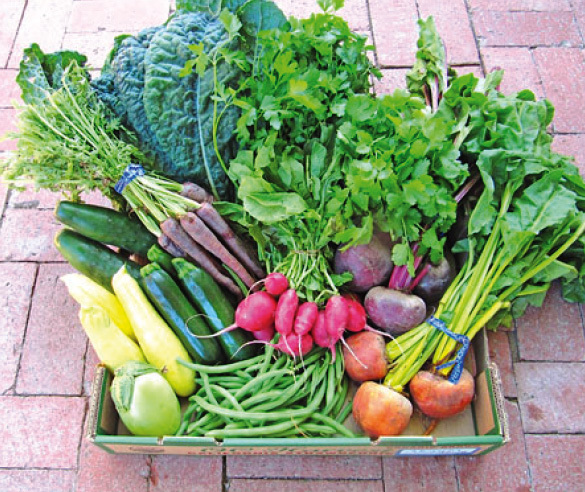 Alegría Fresh announced that it has partnered with Orange County Produce, LLC, to offer a locally grown, certified organic, freshly harvested summer vegetable box. Delivering on its promise to offer the freshest produce available, Alegría’s vegetable box is delivered within 24 hours of harvest and can be customiz ed to suit individual tastes. Orange County Produce, LLC, is managed by third- generation family members A.G. and Matthew Kawamura, farming over 800 acres within the urban boundaries of Orange County. “Our family has been growing fruits and vegetables in Orange County for 57 years,” said A.G. Kawamura, Founding Member, Orange County Produce, LLC and former California Secretary of Agriculture. Alegría Fresh offer its subscribers and local chefs an array of seasonal vegetables including organic green beans, cranberry beans, yellow squash and green zucchini, cucumbers, red and golden beets, purple carrots, radishes, strawberries, blue, red and curly kale, green bell peppers and more, all grown in Orange County. “A.G. and his brother have made tremendous strides toward improving nutritional content in the organic produce they offer in our local community,” said Erik Cutter, Managing Director of Alegría Fresh. “They care about health and are meticulous farmers with great integrity and we are proud to partner with them to educate the public about the benefits of consuming fresh, locally grown produce. We are working together to create greater efficiencies by reducing waste and pushing new technologies to improve urban farming processes to meet the great challenges facing our food production and distribution systems.”Laguna Beach can arrange for pick up. Through hydroponic vertical farming, Alegría Farm grows leafy greens, medicinal herbs and vegetables up to seven times more nutrient rich as anything found in the local supermarkets while using no soil, 90 percent less water, 70 percent less land and 50 percent less fertiliz er. On special order, subscribers can receive these greens and medicinal herbs delivered to their door within two hours of harvest. In addition to vegetables and greens, Alegría Fresh also offers sunflower sprouts and other microgreens such as fenugreek and pea shoots. Sprouted seeds are nature’s most complete and nutrient- dense food, and Alegría Fresh delivers them within an hour of their harvest to retain their full flavor and nutrient load.